A bacterial condition seen in chickens and usually caused by Clostridium septicum, occasionally Staphylococcus aureus, rarely Clostridium noyvi / oedematiens. Morbidity may be up to 50% and mortality is high. It occurs due to invasion of 'normal' wounds by 'normal' bacteria in immunosuppressed birds. Immunosuppression is therefore a predisposing factor, especially following congenital Chick Anaemia Virus infection or early Infectious Bursal Disease Virus infection (Gumboro Disease). The spores of Clostridial bacteria are highly resistant in the environment. Severe cellulitis especially of thighs, wings, wattles. Patches of gangrenous skin with underlying emphysematous and/or sanguinous cellulitis, usually over wings and breast, sometimes thighs and other parts. Swelling and infarction of the liver, spleen. Clinical signs and/or lesions. Recovery of an abundant growth of causative organism in recently dead birds. Good hygiene and management. Avoid skin trauma and immunosuppression (congenital CAV infection, early Infectious Bursal Disease Virus infection). Figure 21. 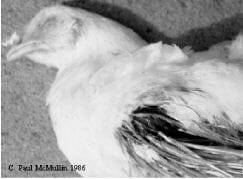 Severe gangrenous dermatitis on the upper surface of the wing of a broiler chicken.